I’m sure you’ve probably heard of a cat cafe. 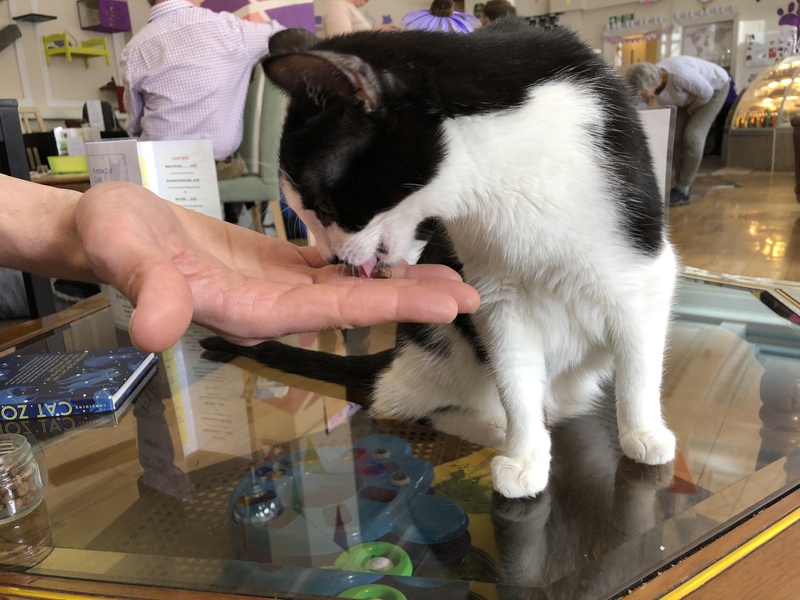 Well that’s what Purrple Cat Cafe is; a cafe where you can not only eat, but also where you can spend time with some lovely cats. It opened late 2017, and is the first one in Glasgow. Our beautiful old kitty, Mr Tinkles, sadly passed away last year; a loss we all felt, including (and in some ways especially) the little lady. It’s been over a year since our Tinky died, and the little lady still talks about her all the time; at least every few days. She tells me she misses her, she sometimes still has a wee tear in her eye when she talks about her, and she tells me constantly that she would like a new pet (because apparently our labrador is not a pet – she’s her sister). I have been considering finding a new furry family member for quite a while but honestly, life is just too busy at the moment. And it probably will be for a while. 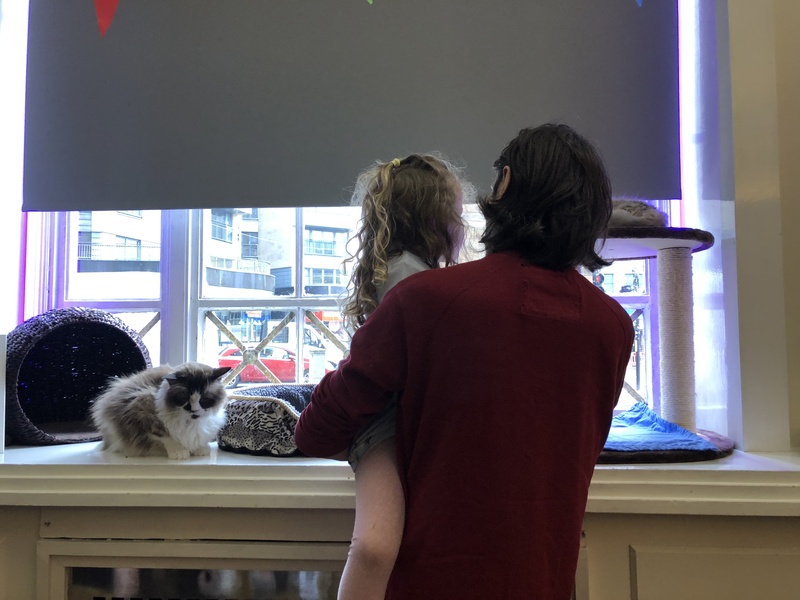 So I thought that I’d take her along to the Purrple Cat Cafe where we could spend a little time with some friendly kitty cats, giving us both our feline fix. And it might even help the little lady to deal with the loss of our own cat. There are (at least) 21 cats who live in the cafe. Some are young, some are older. Some are super playful. Most are shorthairs but there are also a couple of super fluffy ones. 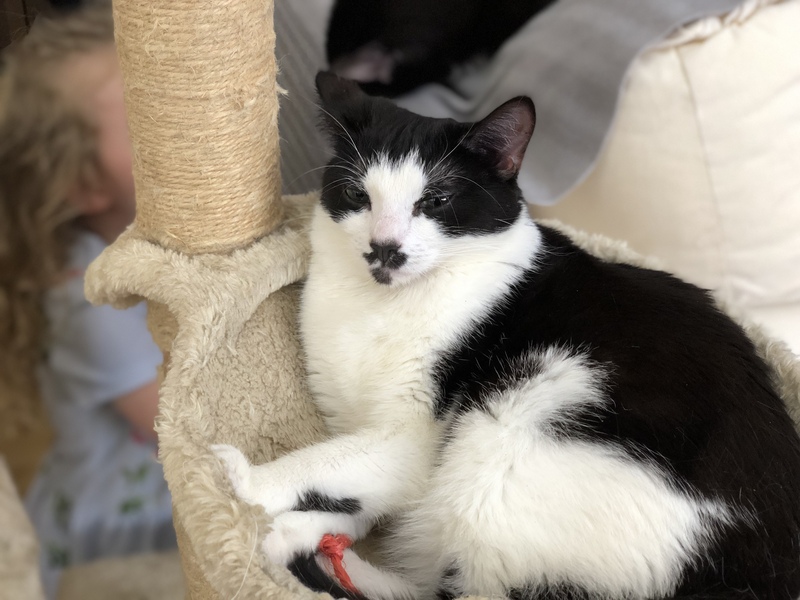 They roam freely around the cafe; sleeping under tables, wandering around, sitting on the seats or sofas with you and generally being super friendly. Tilly the very fluffy ragdoll was one of the little lady’s favourites. Her other favourite was Whiskey, who looks so much like our old lady did. The cats were mostly sleeping or resting and watching the world go by, but some were wandering around looking for attention. The little lady tried her hardest to get them to play with a cat toy she found nearby but none of them were bothered with it. You could pay £1 for a little tub of food which we did. A few of the cats were up for being fed and she adored feeding them. 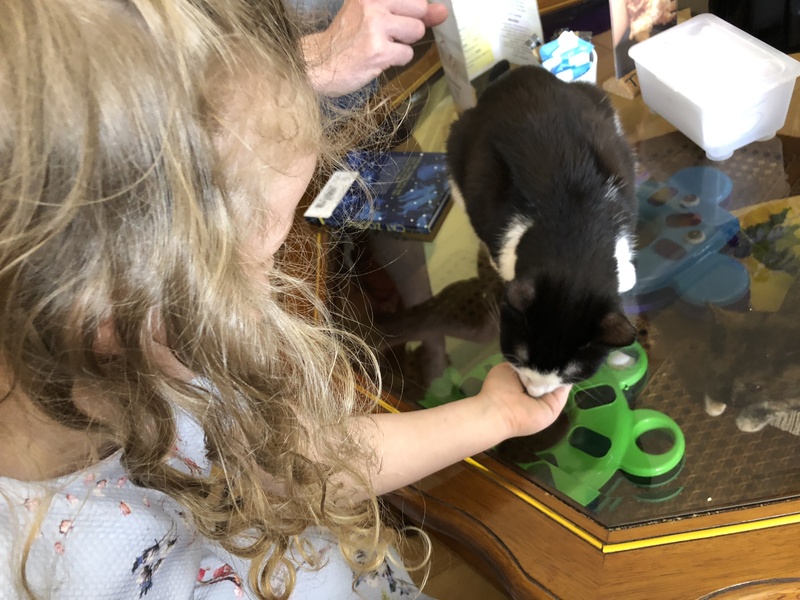 After we’d eaten, she went round the room patting and feeding whichever cats she could reach until our sessions was finished. She absolutely loved them. The cafe serves up soup, sandwiches, wraps, toasties and baked potatoes, plus a few other things. To be completely honest the food was fine. It wasn’t bad at all, but it wasn’t amazing. And it was a little overpriced for what it was. We each had a bit of cake too (with tea, obviously) which was delicious. I don’t think the cakes are homemade, but the ones we had were really nice. Lots of options too and they all looked amazing. If you’re not a member each session costs £5 per person. (I have no idea what it costs if you are a member!) no under 5’s are permitted. Though they did run some baby/toddler sessions as a trial; I’m not sure if they have or will ever run those again. Pots of food for cats cost £1. 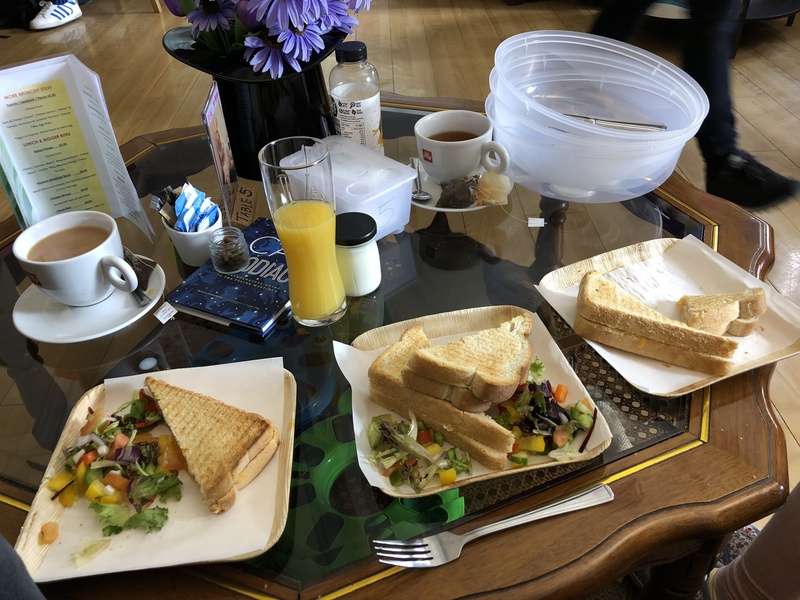 For the 3 of us having sandwiches/toasties and cake and teas/apple juice the total cost for food was about £34. I’d recommend booking a session time before you head along. It was busy when we were there (midweek at lunchtime) and had we not booked it’s unlikely we would have gotten a table. My main piece of advice would be don’t go here if you don’t like cats. I don’t know why anyone would, but I feel like that’s important to note! Those cats are just lovely. If you like cats and don’t have any of your own to pat (or even if you do) then this is the place for you. 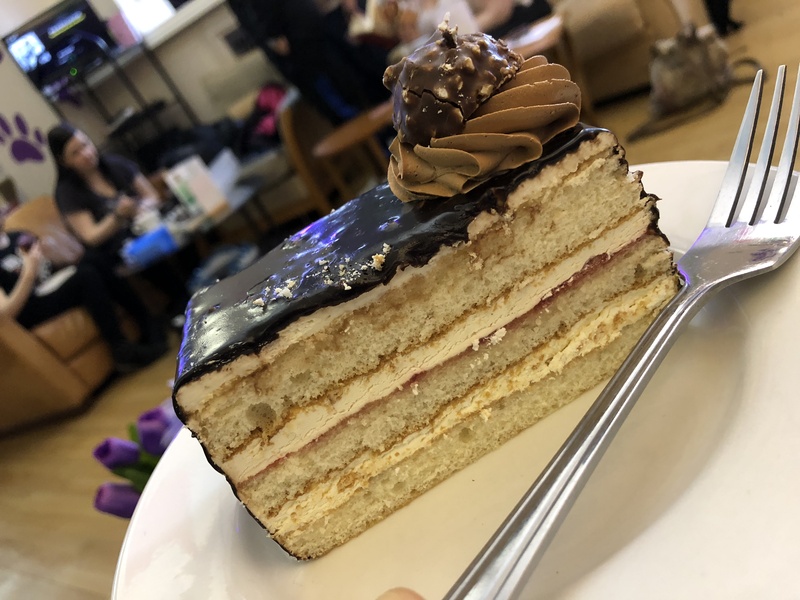 The food is probably a bit more expensive than I’d like to have paid for it, but the cake was really delicious. 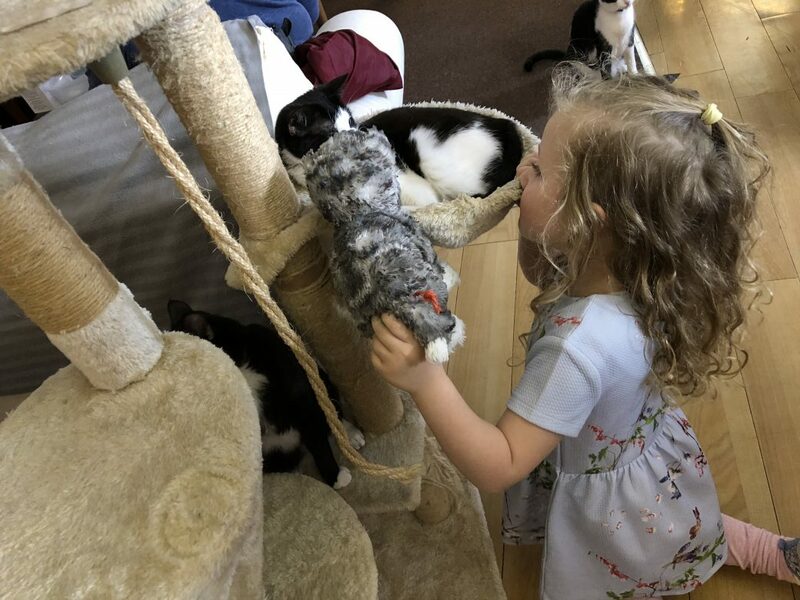 The little lady had a wonderful time meeting all the cats and she has asked me so many time when we can go back. 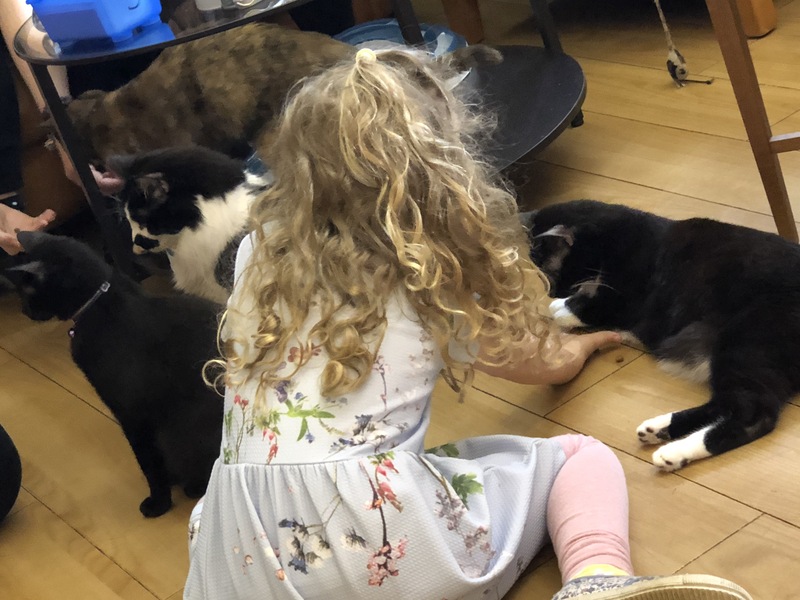 The joy that she got from being around the cats was totally worth it. 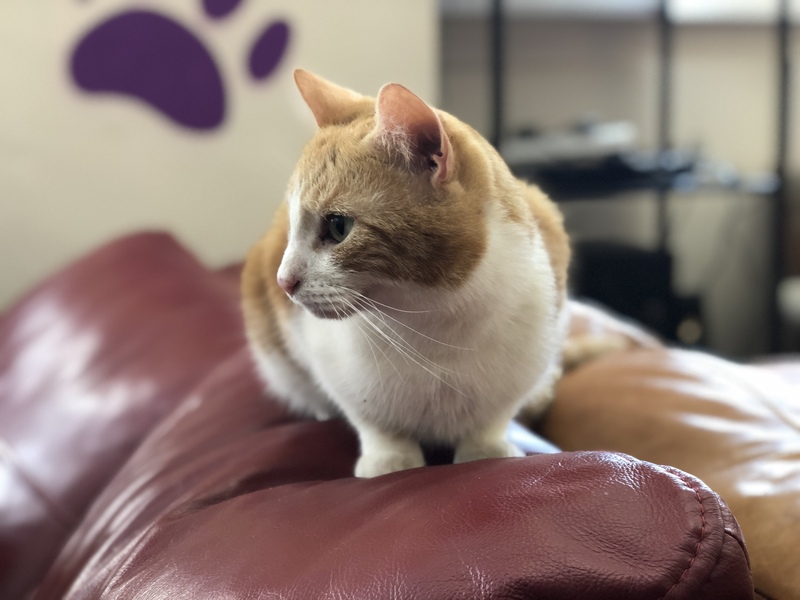 The Purrple Cat Cafe is located at 2 Trongate, Glasgow, G1 5ES.